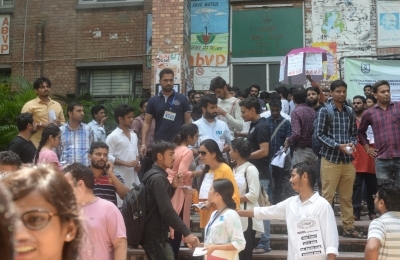 New Delhi Sep 14 (IANS) About 70 per cent of the Jawaharlal Nehru University (JNU) students cast their ballots on Friday to elect their candidates for top posts in one of the most charged campus elections in the country. A total of 5 185 votes were polled out of 7 650 according to the information received by the Election Committee which comprises university students. Unofficial sources said this was first time that so many students have turned up to vote in the union election. The election is primarily for the posts of President Vice President General Secretary and Joint Secretary. Currently all the four posts are held by Left s Geeta Kumari Simone Zoya Khan Duggirala Srikrishna and Shubanshu Singh in that order. This year there are eight candidates in the fray for the post of President. AISA AISF SFI and DSF all leftist groups active in campus politics have come together -- like last year except AISF which had its own president candidate -- to form an alliance and have fielded International Studies scholar N. Sai Balaji as their presidential candidate. The Rashtriya Swayamsevak Sangh-affiliated student wing Akhil Bharatiya Vidyarthi Parishad (ABVP) has fielded Lalit Pandey for the same post. The Congress-backed National students Union of India (NSUI) has chosen Vikas Yadav as its presidential candidate who is a student of Inner Asian Studies. Yadav escaped dismissal of his candidature last Friday when the Grievance Redressal Committee of the university recommended nixing of his nomination for being a subject of a disciplinary action by the university authorities for protesting and blocking the roads of campus. The recommendation was however rejected by the Election Committee. Another presidential candidate is Jayant Kumar from the student wing of Lalu Prasad Yadav s Rashtriya Janata Dal. Though considered a lightweight originally Kumar raked in a lot of applause from all stripes of students in the Wednesday s presidential debate in which he castigated Left and Right both for their "hypocrisy" in an impeccable speech. The results of the election are likely to be announced on Saturday.